Can Louboutin do wrong? The answer is a very obvious NO! 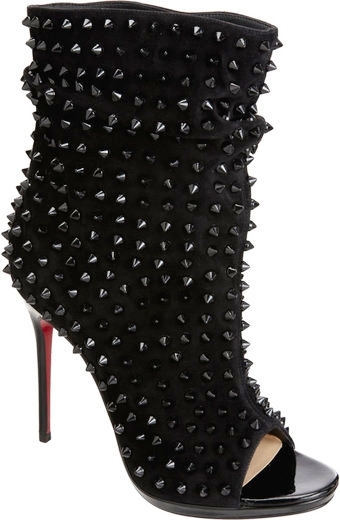 He continues to rock our world with shoes that are beyond like with this Christian Louboutin Guerilla Slouchy Studded Suede Ankle Boot. Its as if this boot came with a prerequisite of "must be a diva to wear these" because they are uber-fabulous. This open-toe suede ankle boot features a slouchy, luxe suede upper adormed with allover edgy spikes, a 4 1/4" covered stiletto heel with 1" platform and a fashion perfection title.